We’re just back from a few days in Carlow and whenever I go (which is a lot, I’m very lucky that my mum has a small holiday home down there) I discover more fantastic things to do and the beauty of the county continues to surprise me. I thought I’d write up a post outlining some of our favourite places and things to do in or near the county, and stuff I’ve researched and we plan to do in the future. Carlow deserves more love than it gets, it’s a short trip from Dublin if that’s where you’re coming from and once you’re there there is a wealth of things to see and do. So come along and get your mildly surprised expression ready as we peruse the beauty and wonder of the Dolmen county! This was always going to be my top suggestion. I’ve been coming to St Mullins for over two decades and it is a truly magical, tranquil, fascinating and beautiful place. There’s the ruins of an old monastery, a motte and bailey, a holy well, a great cafe with possibly the nicest outside seating in the country, fishing, river swims, kayaking/boating, numerous beautiful walks. My favourite walk is Jacob’s Mash, a short but beautiful walk - perfect for those of us with kids - along the river from St Mullins to the first lock of the canal that runs to Graiguenamanagh, the 6km walk to Graig is worth doing if you’ve no small folks with you, stop for a lovely lunch in Barrow’s Keep and grab a taxi or, if you’re feeling energetic, walk back. Perfection. St Mullins really is my happy place. 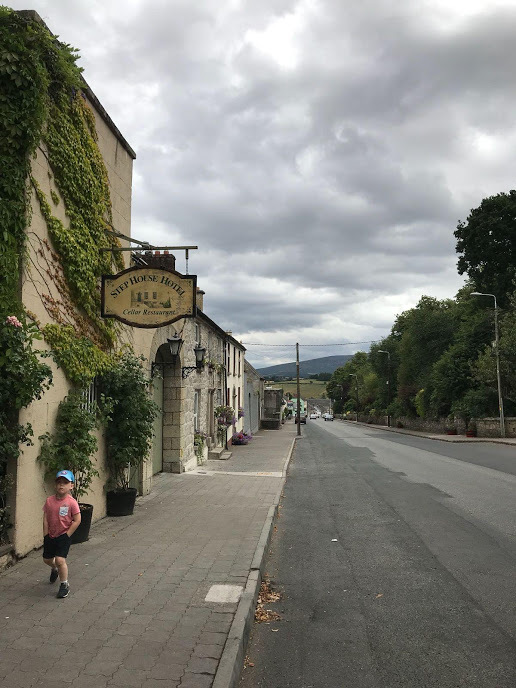 Borris is a wonderful town with good food and accommodation options if you’re planning to explore the Blackstairs and Mount Leinster area. Borris House is a beautiful historic Tudor Gothic mansion and is open to visitors during May to September, be sure to check their website for opening times. Pop into the Step House for a delicious dinner after a stroll around Borris House and its lush gardens. Borris House also hosts the annual Writing and Ideas Festival, which always looks fantastic. Clashganny House, a short drive outside of Borris, is a wonderful restaurant in a very picturesque location, well worth a visit. Lorum Old Rectory looks like a fabulous place to stay, every time I pass it over the years Wuthering Heights comes to mind, this is always how I imagined it in my head, it helps that the weather is often grey and moody!! There are lots of incredible eco trails around the Blackstairs, I haven’t had the opportunity to do these yet as my kids are still too young to go for longer hikes but it’s definitely on the cards for the future. I know from driving through the area that the hikes would be something pretty special. There’s also a really nice food and craft market in Borris Town Hall on Friday mornings, a great spot for locally sourced produce and discovering local crafting and artists. Most folks, when they think of Carlow, think of it as a student town, but there's more to it than meets the eye, for a start it has the biggest art gallery in Ireland: the VISUAL Centre for Contemporary Art and The George Bernard Shaw Theatre. I haven’t been yet but I’m dying to visit. It’s worth keeping an eye on their website for shows and events. They have a permanent and free Make and Do space for families/kids to explore and make art. It truly sounds like a cultural gem. Just on the outskirts of Carlow town is Delta Sensory Gardens, myself and Frank visited here last summer and we loved exploring the series of award winning gardens, each one more tranquil and pretty than the last. There’s a cafe on site too and the staff are lovely. A short drive and resting between Carlow town and Tullow is Duckett’s Grove. We visited here recently and I was blown away, it is the ruins of a 19th century estate with a lovely tea rooms, very pretty walled gardens and lovely parkland surrounding it. It is very beautiful and well worth a visit. The drive in (from Carlow direction) is particularly breathtaking, it is a fierce Instagrammable spot! I believe Brownshill Dolmen is another historical place worth visiting close to Carlow town. Another appeal of Carlow for me is accessibility to neighbouring counties which have lots on for kids, families and adults alike. Last summer my mum and I took a drive (less than an hour from St Mullins) to Kilmacthomas where we hired bikes, and a trailer for the toddler, and we cycled the Waterford Greenway to Dungarvan, it was an absolutely brilliant way to spend a day and the views on the Greenway are something very special. We also frequently tip over to New Ross, which has the Dunbrody Famine Ship (worth a visit with older kids but might be a bit scary for very young kids) and the JFK Arboretum which is a beautiful place for walks and has a lovely playground and picnic area. Kilkenny, with its wealth of history, design and food is only a short drive away. There is the National Reptile Zoo in Gowran, another spot that’s long been on our to-visit list. Castlecomer Discovery Park is another fantastic day out with kids. That’s all for now, I know there’s so much more and I’ve only touched on it here but we’re going to keep exploring this wonderful county and all it has to offer. I really can’t say enough good about a visit to Carlow and it’s surrounds. If you’re a Carlow native or know the area well I’d absolutely love to hear from you about things to do, places to visit, events, restaurants, anywhere worth mentioning, please do add your suggestions in the comments! On The Subject of Miscarriage and Coping (or not particularly coping, as the case may be) With Pregnancy After Loss.